Sweet southern living is celebrated at Blue Magnolia – a charming little shop in the center of historic New Bern that is brimming with chic home décor, artisan pieces, and many other surprises and treasures to uncover. A colorful destination that features a beautiful supply of goodies as well as plenty of southern hospitality to go around, this charming little shop will be a favorite stop along any shopping expedition of the heart of New Bern. 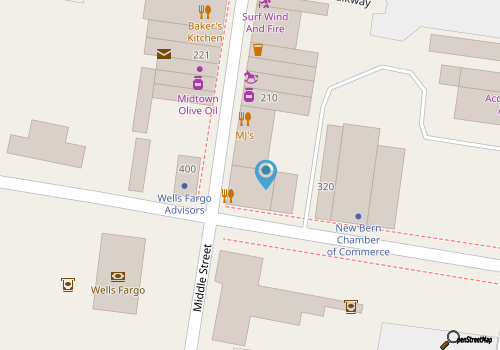 Blue Magnolia is nicely easy to reach for visitors staying throughout New Bern, thanks to a central locale along Middle Street in one of the community’s historic and distinctive brick buildings. Under the bright awning, visitors will be treated to a variety of goods as soon as they walk through the door, which includes handcrafted and one-of-a-kind jewelry pieces, colorful artworks, unique home décor, and purses galore. The shop has a decidedly southern theme, with beautiful colors and delicate pieces throughout, and with new merchandise arriving to celebrate every season, frequent visitors will want to return again and again to see what surprises are in store. Always a delightful destination, Blue Magnolia pays homage to southern living, and is always a fun shop to explore.